image for a wider, high-resolution view of the scene. Ever since the Deepwater Horizon drilling rig exploded on April 20, the National Oceanic and Atmospheric Administration has been analyzing satellite imagery to help figure out how far the spill has spread, and where it's likely to go next. The best projections suggest that oil will reach the Mississippi River delta as early as tonight. For the latest from NOAA, check out the agency's Incident News Web site, which includes maps of the oil spill's "footprint." You'll also want to keep track of the U.S. Coast Guard's Joint Information Center on the Web. Gulf of Mexico on April 29. Click on the picture for a larger view from NASA. Terra and its satellite sibling, Aqua, circle Earth in a nearly pole-to-pole orbit at an altitude of 438 miles (705 kilometers). Under typical conditions, it would be tough to spot an oil slick in visible light from outer space, because the sheen of oil darkens the blue ocean background only slightly. But the slick shows up as a bright swirl in the image above because Terra made its observations from just the right angle, during a time when sunlight was glinting brightly off the oil. 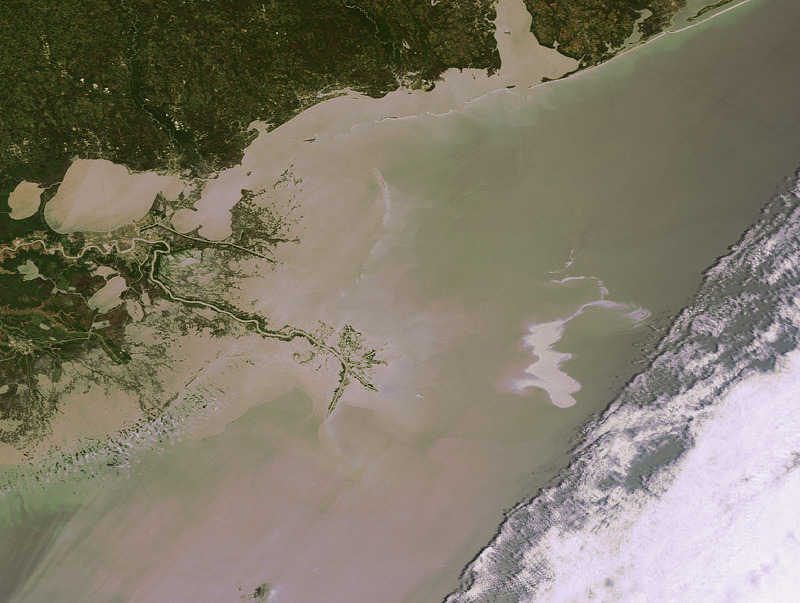 For more NASA satellite imagery of the oil spill, click through the roundup at the agency's Earth Observatory Web site. get this view of the oil spill on April 26. Click on the image for a larger view. Envisat is following the spill from an orbital height of about 500 miles (800 kilometers) - using its Advanced Synthetic Aperture Radar (ASAR) as well as its Medium Resolution Imaging Spectrometer (MERIS). Neither clouds nor darkness hinder the radar imager, because ASAR provides its own "illumination" in the form of long-wavelength radar transmissions. But because the radar signals are in only one wavelength, the resulting imagery is in black-and-white instead of color. Check out this Envisat FAQ for more about how radar imaging works. Meanwhile, MERIS has been providing multispectral imagery of the spill, which looks similar to the pictures from Aqua. Envisat's images and maps are being provided to U.S. agencies under the terms of the International Charter on Space and Major Disasters, which calls for sharing remote-sensing satellite data to civil protection agencies and other in response to disasters. The charter has come into play for the oil spill as well as this month's Iceland ash cloud, China's recent magnitude-6.9 earthquake and Haiti's seismic disaster. the oil spill near the Mississippi River delta. Click on the image for a larger version. Commercial satellites are contributing images to the cause as well. DigitalGlobe's QuickBird satellite has been keeping track of the Gulf of Mexico spill from a height of 280 miles (450 kilometers). The oil sheen glints in shades ranging from red to green and blue in pictures with enough resolution (2.4 meters per pixel) to make out planes and boats passing through. For more DigitalGlobe imagery, check out the company's Flickr gallery. ships pass through, as seen in this image from DigitalGlobe's QuickBird satellite. Click on the picture for another perspective from msnbc.com's Photoblog.